Find out how to customize default and current department titles and roles. Are you looking to assign a custom crew position? Crew position names and department titles can often change depending on the type of production you're shooting. For example, if you're shooting a motion capture shoot, you may want to customize some of the positions and department titles to reflect exactly what you need. But how do you add a custom job role to a department? It's easy to customize your departments and positions, and even change the order of crew on the call sheet. On the Project Overview page, click Manage. Then click Departments from the sidebar. 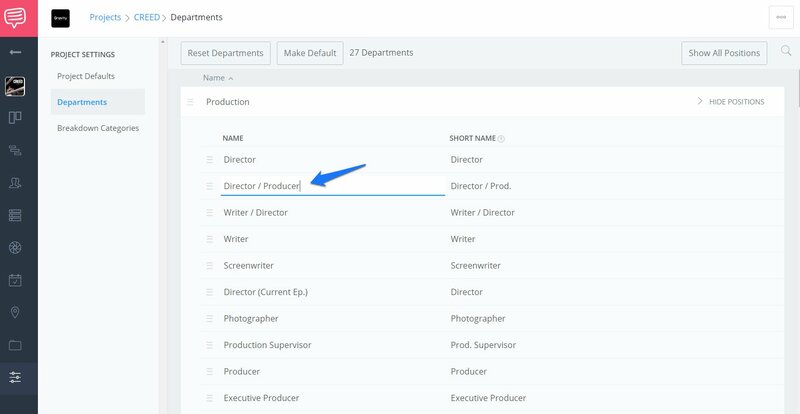 On the Departments page, click Show Positions to expand positions within a Department and you can make your changes inline. All changes will be saved automatically. Note: To change positions and departments for existing call sheets, you can access the Departments section by clicking Manage on the call sheet (in the Crew section). Will my current call sheet be affected? If you updated department/positions within a project, then all unsent call sheet drafts will be updated automatically, however, previously sent call sheets will not be affected. Can I add or remove positions or departments? While you are not able to remove positions or departments, you can easily edit (rename) positions to fit your needs. Can I make a template with my changes? If you want your changes to carry over to future projects, click Make Default. This will make it easy to assign roles in the future without having to retype the information. To change the hierarchy of positions that appear on the call sheet, you can easily drag positions (or departments) higher and lower on the page. Can I reset positions and departments? If you ever need to go back to the default department names, just click on Reset Departments. This is great to avoid manually reverting crew roles if you are starting a new production and find that your custom positions may not apply. Why is a Department name repeated twice on my call sheet? If your Department name if repeated multiple times, this is most likely due to the Department title updating. Not to worry though, you can easily Reset Departments to revert to the original names by following the steps above (simply click Reset Departments). I changed a department title and it's not appearing on my call sheet, why? This is most likely due to the update happening on your main Departments page, versus your Project Departments page. Update it inside the Project that you're looking to upgrade, save it, and then try locating it once more. It's easy to create a custom list of your contacts. This is useful when you want to easily search and communicate with specific crew members. Assign multiple positions or roles to a contact. This comes in handy if someone is playing multiple roles in a production, and you want it to reflect on a call sheet.